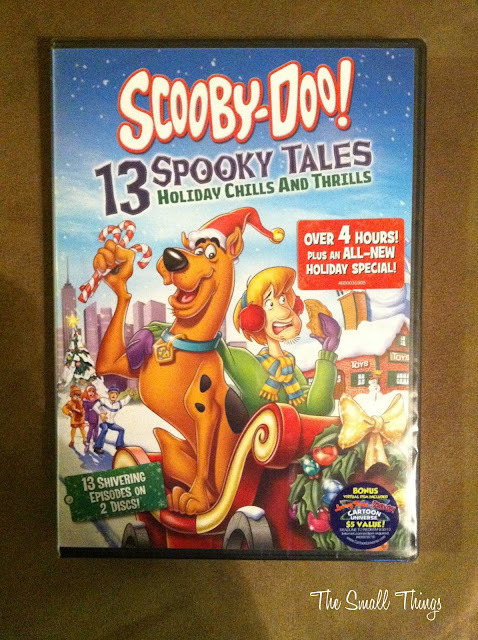 You have seen me talk about Scooby-Doo Dvd's on my blog, I have a cute one to share with you today!! This is available to buy NOW in stores!! Get your kid(s) ready! Scooby- Doo! is here for Christmas!! BURBANK, CA (November 14, 2012) – It’s holiday high-jinks and merry-making escapades with Scooby-Doo and the Mystery Inc. gang when Warner Bros. Home Entertainment releases Scooby-Doo! 13 Spooky Tales: Holiday Chills and Thrills, the all-new, must-have animated collection available October 16, 2012. This compilation is comprised of 13 action-packed classic Scooby-Doo! adventures that promise to get viewers into the spirit of the season and includes a brand-new 22-minute Scooby-Doo! holiday movie titled Scooby-Doo! Haunted Holidays. Scooby-Doo! 13 Spooky Tales: Holiday Chills and Thrills will retail for $19.98 SRP. Jinkies! It may be the holiday season but there are several mysteries that need solving! Scooby-Doo and the gang however, still manage to have plenty of fun in Scooby-Doo! 13 Spooky Tales: Holiday Chills and Thrills. It’s non-stop chills and thrills as the gang sets out to solve 13 suspenseful mysteries on this holiday-inspired compilation. In the all-new Scooby-Doo! Haunted Holidays, Scooby and gang face a chilly and frightful holiday season when they try to solve the mystery of a sinister snowman, which has come alive in a downtown area and appears intent on destroying an old and revered toy store. The gang sets out to help kids in a children’s home as they put on a Christmas pageant in The Nutcracker Scoob. In There’s No Creature Like Snow Creature, Scooby and the Mystery Inc. team travel all the way to a Tibetan mountain resort that’s being terrorized by a mysterious snow creature. In Toy Scary Boo, Scooby and his friends encounter living toys that have taken over a store. These and many other exciting mysteries await Scooby-Doo fans in this not-to-be-missed collection! Scooby-Doo!, the hit franchise follows the adventures of Daphne, Fred, Shaggy, Velma and Scooby-Doo as they travel in their van “The Mystery Machine” and solve cases typically involving ghosts, monsters or other supernatural forces. High-jinks always ensue, with their investigations resulting in entertaining chase scenes mixed with catchy musical numbers and comedic antics. The original television program went on to become one of the most successful animated television programs in history and spawned several spin-off series, specials, consumer products and live action films. This would be so great for my daughter! She loves Scooby Doo! 23 years old and I still love Scooby Doo! I need to get this.